In 2010, Disney's Hollywood Studios hosted an event called "The Last Tour to Endor" as an evening entertainment option for guests attending Celebration V in Orlando. The event was to celebrate the last few rides on the original version of Star Tours before it changed to a 3-D attraction with added content. Here we are in 2017 with another major event called "Galactic Nights" taking place at Hollywood Studios. Fans familiar with Star Wars Weekends have referred to this event as a "miniature version" of Star Wars Weekends. For those who remember Star Wars Weekends, as you walked up to the front of the park you'd hear Star Wars music and see captivating banners and posters promoting the event. At Galactic Nights, a special red carpet and backdrop flanked by planet banners caught the eye of guests as they passed bag check. Each guest who attended the special event received a badge and lanyard as they passed through the electronic ticket collectors. Guests were instructed to visit all the photo op locations inside the park to collect puzzle piece stickers that could be used to complete a diagram on the back of the badge. Launch Bay is one of Disney's Hollywood Studios' most popular Star Wars attractions. Death Troopers and Astromech Droids provided surveillance for the immediate area leading up to Launch Bay. While none of the items on display in Launch Bay are screen-used, the replica props are some of the most impressive items you'll see at this park. Chewbacca, Kylo Ren, and the newly added BB-8 were all available for meet and greets with eager fans of all ages. At the conclusion of the Launch Bay walk through, guests end up in the Launch Bay gift shop. This was one of only a few places in the park that guests could buy official Galactic Nights merchandise. Stars in Cars was a motorcade with Ray Park, Anthony Daniels, Vanessa Marshall, Warwick Davis, John Knoll, Peter Mayhew and Alan Tudyk. It's always great seeing these celebrities wave to their fans and enjoy the magic of a Disney parade. Each of the celebrity guests made their way to the main stage briefly to speak with Mark Daniels. 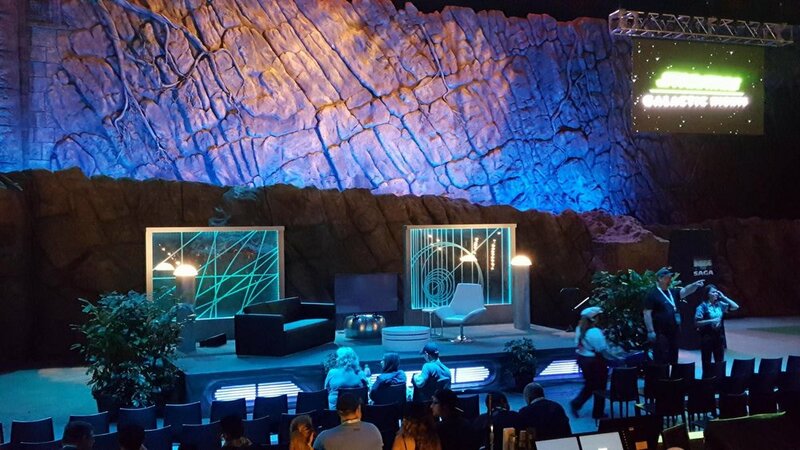 One of the most exciting aspect of Star Wars Weekends was the talk shows that took place in various auditoriums throughout the park. "Inside the Saga" was the Galactic Nights' version of the talk shows. It took place in the Indiana Jones Stunt Spectacular auditorium and was decorated like the Rebel base. 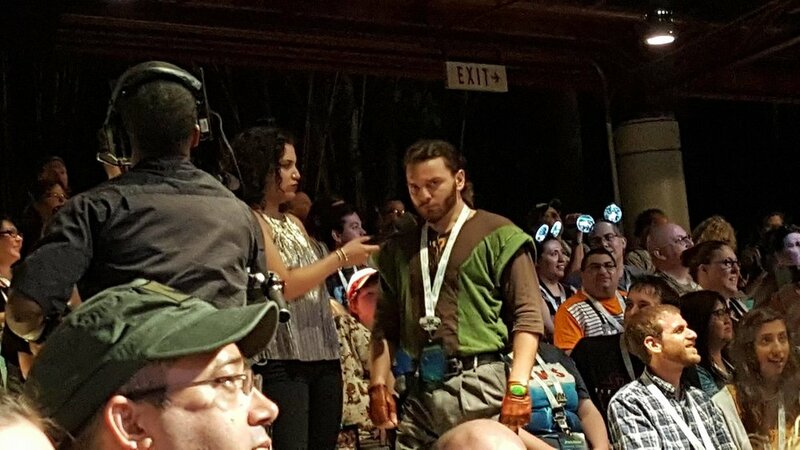 Andi Gutierrez and Anthony Carboni meandered through the crowds of people asking for people to provide their best Star Wars impressions into the microphone for the entire audience. As you can probably imagine, some were great and some were...uh...not so awesome. 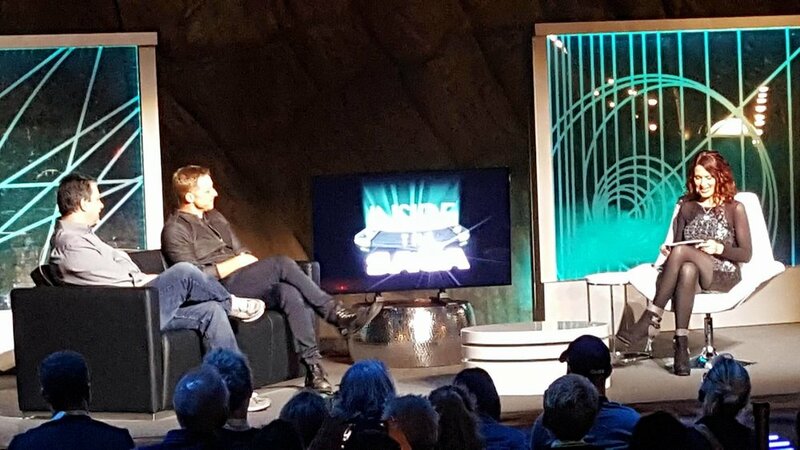 Vanessa Marshall (Hera Syndulla from Star Wars: Rebels) hosted the talk show and interviewed ILM's John Knoll and the man behind K-2S0, Alan Tudyk. "Inside the Saga" had three different show times throughout the evening. Disney wouldn't be Disney if it weren't for the rides, right? Of course, there is the Star Wars ride that everyone knows about, Star Tours. This attraction was open for all guests to enjoy, but surprisingly one of the most exciting ride experiences of the night was the Rockin' Roller Coaster Starring Aerosmith. This ride is always a blast, but for Galactic Nights they decked the ride out with Star Wars features. The queue line consisted of Star Wars music and special Galactic Nights artwork for fans to enjoy during the short wait. At "The Last Tour to Endor" event in 2010, the end of the night consisted of a fireworks show that left the jaws of nearly every attendee on the floor. Technology has improved exponentially in the last seven years, so at Galactic Nights, Disney had what they called the "Galactic Spectacular". This portion of the night included a laser light show with fireworks and lights projected on The Great Movie Ride behind the main stage on Hollywood Boulevard. The Galactic Spectacular covered content from all the movies and was accompanied by some of the most iconic Star Wars music of all-time. There's a lot of exciting things coming from the Disney Parks related to Star Wars. 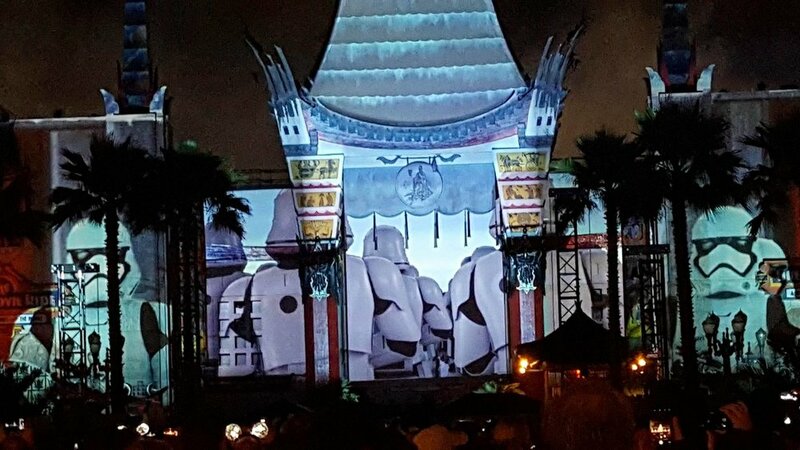 Be sure to expect more of these themed events as well as the highly anticipated Star Wars Land in 2019.